In Big Agenda, David Horowitz shows how Trump will defeat the left's destructive agenda and roll back Obama's nightmare policies of Obamacare, massive regulations — even his war on God! But it won't be easy, Horowitz says. "The election battle may be over, but many more battles lie ahead for President Trump and conservatives," Horowitz writes. Horowitz says it's time to take the gloves off. It's time to go for the jugular. It's time to beat the Democrats once and for all. And Donald Trump is the president to do it. In Big Agenda, Horowitz unveils the left's true nature, their hidden methods and motivations, and the dirty, underhanded tricks they use to advance their goal of total control over our lives. Horowitz also reveals Trump's secret plan and his winning strategies to thump the liberals. Obama’s secret “deep state” of loyal aides still in office plotting to destroy Trump! See page 7. Trump's plan to 'Make America Great Again' abroad — putting China in its place, Iran on notice and backing friends like Israel. Trump's coming war with ISIS and how it will change the Middle East forever. Why Trump is turning the tables on the liberal media. Page 11. How "socialist" Democrats are mainstreaming into America. What you must watch out for . . . on page 28. Trump's plan to end the racial divide and Democratic ownership of the black vote — he really has a plan. Why the left applauds this. The grim details start on page 50. The 9 words Obama removed from the Oath of Allegiance to the United States (it's bad) — and why Trump will fix it soon. Read about it on page 57. The end of the public unions! This is a key cornerstone of Trump's plan — and it will create a political revolution in America. Why the Iran deal is bad for America . . . and the completely legal strategy Trump will use to restore America's sovereignty. See page 56. The Achilles' heel of the Democrats and how Trump will use his "New Deal" to exploit it. The Democrats may never win another presidential election. Details on page 86. The one theme that can unite America: Trump's 3-step strategy to end the Democrats' assault on American values. You must read page 141. The 21 major predictions about President Trump — 11 have already come true and 10 will happen soon! Find out on page 154. The gun rights rollback: Obama tried to flatten the Second Amendment. Trump has a surprising gun rights plan. Page 158. Education overhaul: Trump's new plan to make America great again through our classrooms — and end student indoctrination! Newsmax Magazine is the one source that brings you in-depth cover stories and hard hitting investigative reports that you can't find in mainstream media outlets. Even the mainstream media can't ignore Newsmax Magazine — which has been cited on Meet the Press, CNN, Fox News, MSNBC and many other outlets. 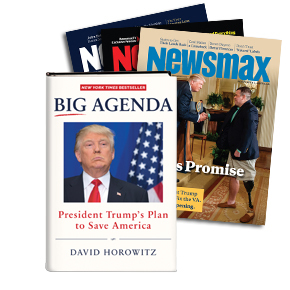 Each month Newsmax Magazine features special commentaries from George Will, Michael Reagan, Ben Stein, Dr. Laura Schlessinger, David Limbaugh, Christopher Ruddy, and many others. Today’s world is more complex, and more unpredictable than it has ever been in the past. Now more than ever, you need Newsmax Magazine to help make sense of this ever-changing landscape and how it affects you, your family and your future. IMPORTANT NOTE: Sales tax included where applicable. Your trial subscription comes with convenient automatic renewal. At the end of your subscription, we'll notify you. If you want to keep the publication, do nothing and we'll renew your subscription using your credit/debit card on file. We'll charge you $39.95 (or $35.95 for digital) for one year (12 issues) of Newsmax Magazine and thereafter at the lowest rate then in effect. There is no risk, you can cancel within the first six months for a full refund of the unused portion of your subscription. In Big Agenda, David Horowitz reveals Trump's winning battle plan.